Orlando's abundant sunshine and warm weather generally mean that there's not a single bad time to visit Universal Studios, but April is undoubtedly among the best times to pay a visit to the massive park. Temperatures aren't as scorching as the summer months and summertime crowds haven't yet descended upon the park. While spring break will draw many vacationers to both the theme parks and the CityWalk area, the rest of the month will have average crowd levels. If you are visiting during spring break, be prepared to wait in line for busy attractions like Harry Potter and the Forbidden Journey, but otherwise, you'll find April to be an extremely lovely time of year to visit. Spring has arrived at Universal Orlando! Expect to see flowers in full bloom, sunny days, and comfortable nights. April is a great time to experience rides with outdoor queue areas or to wander through the parks and enjoy the atmosphere before the heat becomes oppressive. April is one of Orlando's least-humid months, but it's still extremely sunny. There are around 10 hours of sunshine each day, leaving you plenty of time to enjoy the park during daylight. April is also a drier month for Orlando, with the city receiving an average of 2.4 inches of rain spread throughout the month. On top of the rides and thrills available year-round, April offers some unique experiences that make for a great vacation. Mardi Gras: One of the biggest parties of the year continues this month; visitors can enjoy the festivities until late April. Head to Universal Orlando for fun parades, street parties, live music and lots of beads as the Mardi Gras celebration concludes. Grad Bash party: More than five years ago, Universal Orlando opened not one but two theme parks to graduating seniors as part of the yearly celebration. Grad Bash features plenty of age-appropriate fun, great ride access, live music, dance parties, and all the fun you can expect from a Universal Orlando party. Grad Bash is exclusively for high school seniors and chaperones. Universal Orlando will close early some evenings for Grad Bash; if you aren't a graduating senior from a participating school, you'll need to find something else to do on Grad Bash nights. 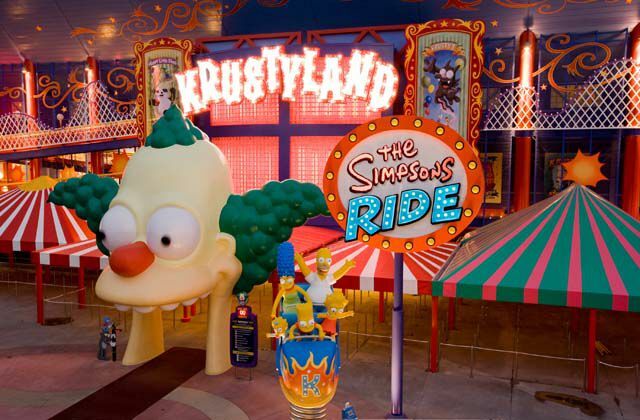 Take advantage of Universal's "Express Access Pass" to eliminate some of the time you'll spend waiting in line for popular attractions like the Simpsons Ride if you are visiting during spring break. Stay at a Universal Orlando on-site hotel for quicker access to the theme parks, especially during peak spring break periods. Universal's Express Pass is a benefit when staying at Hard Rock, Portofino Bay, or Royal Pacific resorts. You will not only have easy access to the parks, but you'll be able to ride select attractions without waiting in line, a huge help during this busy time of year. Enjoy wet or watery rides like Popeye and Bluto's Bilge-Rat Barges in the middle of the day to cool off. While the days are warming up, some riders will still be hesitant to get doused, so you'll be able to speed through the lines. If you are not attending the Mardi Gras party, avoid the food areas and parade route; they will be very crowded. If the heat spikes during your trip, supplement your visit by checking out (and cooling down at) Typhoon Lagoon or the tremendously popular Blizzard Beach, which is modeled after a ski resort.